This week Kat and I attended Book Expo America, the largest publishing event in North America. As releativly new book bloggers it was a great opportunity to network and we met so many wonderful people, and discovered some awesome books. Most people haven't been impressed by the BEA Bloggers Conference in previous years but we saw it as a chance to meet other bloggers.The sessions were okay and it was a mostly a chance to network with bloggers and meet authors. We arrived at Javits and lined up for the Book Blogger Conference at around 8:00 am. In line Charlee Vale was in front of us and , we introduced ourselves and ended up spending the day together. At the networking breakfast all the tables are separated by genre. We were in early enough to snag the YA table and sat at a table with other YA bloggers while the authors jumped from table to table. 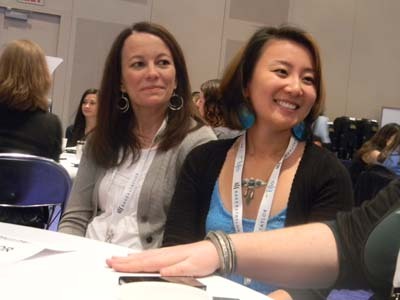 There was a mix up and Ally Condie and Marie Lu came to our table at the same time and shared a chair. They wanted to ask us more questions than we wanted to ask them. The first session Blogging Today What You Need to Know Next was okay but there was a lot of tension when the mention of plagiarism was brought up. The networking lunch was like the breakfast, we stayed at the same table and authors made their rounds. Leanna Renne Hieber and Zoraida Cordova stopped by this time. During the course of the luncheon U.K author Tom Pollock joined us at our table. He wasn't "officially" there but he stuck around and told us about his book The City's Son and invited us to his signing. Later Suzanne Lazear author of Innocent Darkness walked by and offered us shiny things and bookmarks. The next two sessions to follow were Critical Reviews and Demystifing the Blogger and Publisher relationship. The Demystifying session was one of the better sessions. Lindsay Rudnickas from Netgalley gave tips and spoke about what publishers want to from bloggers..
Jenny Lawson, The Bloggess did the closing remarks and the conference seemed to end just as quickly as it began. I think the BEA Blogger Conference is headed in a good direction but the sessions could have been more dynamic and focused. We all woke up early to brave our first day at BEA. At 9:00 am, when the doors opened I was confused and just wandered around following the crowd, seeing which books people were looking at. Next I hurried to the YA Editor's Buzz to hear about new YA titles. Crewel by Gennifer Albin and Skylark by Meagan Spooner both appealed to me. I wanted to pick up the ARCS available outside but after the panel I experienced my first galley-grabbing mob.It looked like the floor of the stock exchange, but I was able to slip through and pick up one copy of Skylark. My first signing was with Tom Pollock's The City's Son. He had crashed our table at the conference yesterday and his line was long. A lot of people were excited for his novel and his accent. I left Tom's line for debut author Sharon Cameron's The Dark Unwinding. I was the first person in line and when it was my turn she told me I was the first person she had ever signed a book for. So many first ! While Kat was in line for Obsidian signing I went over to Spencer Hill and got some lovely swag and Mark Cohen's Masters of The Veil. Around 1pm Kat, Miranda and I met up for lunch at Javits. Even though it was SUPER pricey we wanted to stay close by so we could be early to signings. While Kat and Miranda went to Maggie Stiefvater and Kat Zhang signings I picked up arcs of Venom and Carnival of Souls. Following that Carnival of Souls galley drop I wandered back over to the autographing area to get Suzanne Lazear's Innocent Darkness. While in line I met Spencer-Hill author Lisa Amowitz who was doing interviews on the future of publishing. She was really nice and introduced to me to the gang behind Spencer-Hill. BEA day one finally wound down and we still had Teen Author Carnival to get to ! It was an amazing experience and I couldn't wait for Wednesday. I'm not-so-secretly tickled that Skylark was the one you managed to grab. ;) Hope you enjoy! haha I've never been to BEA but yeah it can get crazy at TLA and ALA. One year at TLA I actually had an entire wall of books fall on me at the Harper Booth from all the mob pushing. That is sooo awesome that you got to talk to Ally Condie. Squee!!! And you guys got some amazing books. It sounds like a fun interaction between the publishers, athors and bloggers. I hope to make it there someday!